This simple little Congregational chapel sits in the main village street of this suburb of Woodbridge. I often cycle past it, but unless you are here first thing in the morning or last thing in the afternoon, it is rather difficult to photograph thanks to the position of the sun. The elegant inscription outside dates it at 1860, and the yellow bricks suggest that they came up the Deben river by boat rather than being fired locally. 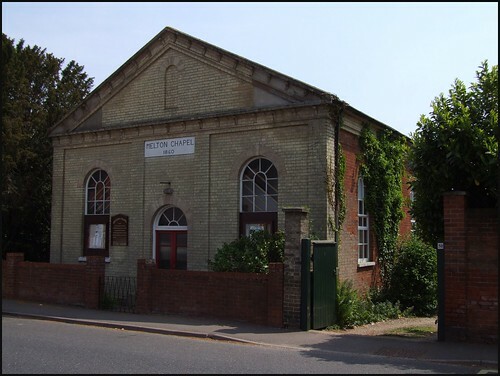 Nine years before the chapel was built, Melton Methodists were recorded in the 1851 Census of Religious Worship as meeting in a hired room, the lower part of a separate building used exclusively for worship. Just 16 of them met in the morning, and 34 in the afternoon. By comparison, Charsfield, a village half the size a few miles off, could boast an attendance of almost 350 in its Baptist chapel. Methodism was never strong in this part of Suffolk, and one asumes that the Methodist contingent here were absorbed into the 1860 chapel, if they were not actually instrumental in its construction. It looks strikingly similar to Primitive Methodist chapels of that date. I have actually been inside this chapel - but that was many years ago, when I managed to do 64 churches on a Suffolk Historic Churches bike ride. This was one of the last churches before I collapsed into an exhausted, hyopthermic heap a few miles north of here in Wickham Market. The people of Melton chapel were very nice, responding to my apparent tiredness with a cup of tea and a biscuit - or perhaps it was the crazed look in my eye that encouraged them to placate me. Whatever, while I am afraid that I cannot recall what this chapel is like inside, I always remember the people here for their kindness.